Line a pan with tin foil. Press a ¼ - ½ inch layer into base of the pan. You can bake to set (7-10 minutes at 350 F) or leave raw. If you bake it, allow it to cool before pouring the cheesecake base. Puree all ingredients in a food processor or a Vita Mix until smooth. Adjust to taste by adding more lemon zest or date paste. And continue to puree for desired smoothness. Pour over the crust and allow to set up for 4-6 hours in the freezer or overnight. In a food processor, process all ingredients until finely ground. The mixture should form into a ball when pressed. 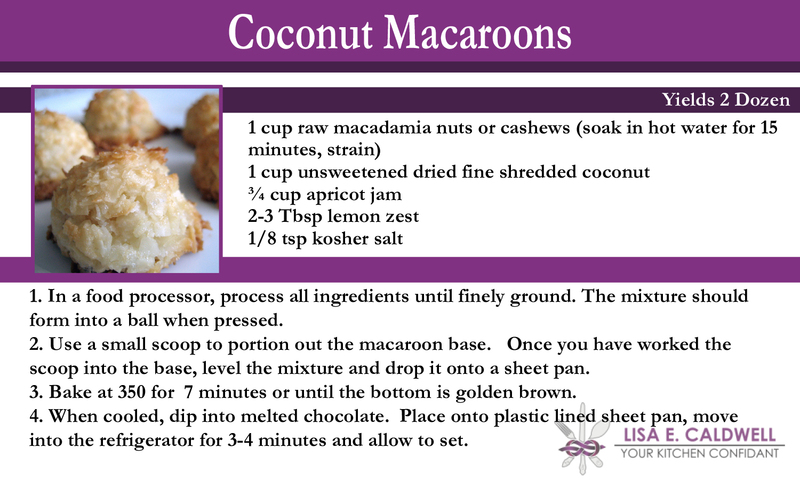 Use a small scoop to portion out the macaroon base. Once you have worked the scoop into the base, level the mixture and drop it onto a sheet pan. Bake at 350 for 7 minutes or until the bottom is golden brown. When cooled, dip into melted chocolate. Place onto plastic lined sheet pan, move into the refrigerator for 3-4 minutes and allow to set. Toast the nuts in oven at 350 degrees. (Consider toasting the hazelnut separate from the rest, you will want to remove the skins afterwards.) Set aside and allow to cool. Seed and then hydrate dates in warm water. Once they are soft, purée in food processor or a high powered blender with ½ of the warm water. Add in the agave and the cinnamon. Combine the remaining water with the cocoa powder to make a paste. Add into the date purée and combine. Once the nuts have cooled, add them to the chocolate date mixture. **Depending on the equipment you have, you may need to add some warm water to help the nuts blend into the mixture. Add chocolate chunks at this time. Once they have blended in and the mixture is smooth, you can spread it out into a foil lined pan (loaf pan for thick, 9x9 for thin) and allow to set up in the refrigerator. To attain the double layer in the photo, spread the PowerBalls recipe onto the bottom of a foil lined pan first, allow to set up in the refrigerator and then spread the raw brownie on top. Bring milks, water, sweetener and vanilla bean to a simmer. Add tapioca and continue to cook on low to medium heat. You will have to stir this to keep it from collecting on the bottom of the saucepan. Cook until the tapioca is translucent. Remove from heat and add basil leaves and toasted coconut flakes. Wrap tightly with plastic and allow to cool to room temperature. No shelf life is known... as they seem to disappear! Hydrate the flax meal in hot water, whisk, set aside. Combine the applesauce, sugar, vanilla and spices, set aside. Whisk the egg replacer with warm water, whisk until the froth is stiff. Combine the flax and applesauce mixture. Add the egg whites, combine. Combine the wet and dry ingredients. After 2-3 folds you may need to add some water. Add the chocolate chunks. Spoon onto a sprayed sheet pan, do not bake off in large round shapes as it will not spread (no butter or sugar). Bake for 7-8 minutes at 350. Allow to cool. Under baking them will give you a moist chewy cookie!